Read this Breakout Poker review to find out about the bonuses and the coupon codes available at this Poker site! Uh oh! It seems Breakout Poker is not available in United States. Find Similar options below. We give you an access to the latest offers from Breakout Poker! Breakout Poker was Established in 2017 and has expanded its reach within a short period of time. This poker site is wholly owned by Breakout Playa Limitada based in Costa Rica and is operated by Breakout Group B.V, a subsidiary of this Group. Breakout Poker is powered by GG group and is also licensed by the government of Curacao. Thus you can rest assured that it provides a safe gaming environment. It accepts a large number of payment methods including the two crypto-currencies BRK and Bitcoin. This makes it relatively easy to enjoy the exciting games like Omaha and Hold'em that it offers. Not only this, you can also claim some big wins by joining the thrilling Free tournaments or trying your hands on luck with the its jackpots. To add to the ease of the players Breakout Poker site is very easy to navigate and all the features that you need are placed right on the homepage. Some unique features like Straddle, Staking, All in insurance and Pokercraft make this website stand apart from the others and worth trying your luck at. You can also download and try the Breakout Poker app which is compatible with all desktop, mac, iPhones and android devices making it a great poker site to play at. If you are you already impressed and want to sign up now to play the thrilling games here. There is one more surprise waiting for you! Breakout poker also offers a myriad of fascinating bonuses and coupon codes which help you win every time you play login to your account. These bonuses start right from the moment you sign up and you are greeted with a 200% new player bonus on your first deposit. The bonuses like Refer a friend bonus (which comes with a $10 bonus for you and $8 no deposit for your referred friend), VIP rewards and many others are also going to make sure you boost up your account balance every time you login to this casino site. Breakout Poker lets you enjoy playing your favorite Poker games whenever you want. The Breakout poker gaming app is compatible with all the iOS apple devices, iPhones and android phones. This software can be easily downloaded by clicking on the download button on the top right hand side. Once the software is installed, you can start enjoying the exciting games available in its gaming lobby. Using the Breakout Poker mobile app is very easy. Just visit the Breakout Poker site and click on the download button. Once the download is completed, open and install the file. However, in some devices, you might get a pop up on the screen saying that the install is blocked. If this happens, go to settings followed by security and check the unknown sources option to complete the installation. If you are using an iOS device, simply go to the settings then general and select trust NSUS in device management. software is installed, you can start enjoying the exciting games available in its gaming lobby. Although you can enjoy a large number of games like Omaha and Hold'em on your mobile and desktop devices at Breakout poker site but it does yet offer live dealers. Breakout poker site but it does yet offer live dealers. All the players signing up at Breakout Poker site are presented with a thrilling collection of Poker games. These games consist of Omaha and Hold'em along with their variants. Apart from top-notch quality games, Breakout poker also provides Jackpot games, frequent tournaments, All-In or Fold and featured tables to keep your gaming spirits soaring high. If you are the one who loves playing Texas Hold'em, you are definitely going to love staking at Breakout Poker. As, it allows you to play as much as you want with no limit on the maximum amount that you can stake in one bet. Along with Hold'em, you can also enjoy playing Omaha at Breakout Poker, just like Texas Hold'em; you will come across some exciting variants of this game once you start playing. And, if you want to add more fun to the gameplay; you can enjoy playing Omaha at the featured table or go for the All-In or Fold version! All the games available at Breakout Poker can also be played at the Featured table of this Poker site which comes with additional features like table chat and unlimited buy-ins. The Featured table is available for all the gaming categories that you see at Breakout Poker viz Hold'em, Omaha and All-In or Fold. So join the feature table now and boost your winning possibilities while you play at this Poker site. Spice up your gaming experience as you get to check out your luck with only two options to choose from – All-In or Fold (AOF). You can go for the AOF version of all the games available at Breakout Poker and get some big wins by your side. Being an AOF player also has its own perks like it makes you eligible to remove the Free Chips at any time – a feature which is not available to the other players. So, what are you going to choose? Along with some exciting games, Breakout Poker also gives you a chance to be a part of some exhilarating tournaments which include Freeze-out tournaments, Progressive bounty, Re-buy tournaments, Satellites, Turbo tournaments and Private tournaments. You will come across new tournaments every month at Breakout Poker to jazz up your gameplay time and again. Some of the tournaments that you can join are Phoenix Re-buy, Daily Guarantees, Bounty Hunters, Omaholic, Chinese Zodiac Free-rolls and a lot more. You can also collect tournament points by being a part of any tournament and get a chance to win a share in $100,000 prize pool if you secure a place in the top 100 players on the tournament leadership board. If you are the one who loves to play it big, Breakout poker gives you an option to try your hands on its exciting Jackpots. You can get some big wins by your side by hitting the best Royal Flush and claiming the All-In or Fold jackpot or by winning instant cash prizes with the Big hand Jackpot at Breakout Poker. Breakout Poker has a thrilling collection of games which provides an unparalleled gaming experience to all the players. Along with this, this Poker site also has some unique features which make it stand apart among the larger number sites of Poker sites in the online gaming industry and makes playing here more fun! This feature allows the players to place a straddle bet before the cards are dealt irrespective of the position makes thus makes playing poker more interesting. Not only this, to add more fun to the gameplay all the players who bet after the straddle bet is placed will get an option to either straddle for go for all in. Forget about the fear of losing to your opponents and enjoy playing with the All in insurance at Breakout poker. This feature helps you get back your losses if you are one of the 2 players remaining and the pot size is minimum 10 times the big blind! View the history of your gameplay or keep a track on the losses and your position in the tournaments with the help of the history tab in your account with the help of this feature. It also gives you an option to track and share your hand moments, overall stats like wins and losses and positions in all the games and the stats of your opponents as well! Breakout Poker also gives you an option to stake not just on the games available at this poker site but also on the other players. Sell your tickets to other players or stake on the ones you think can win with the Staking feature of the Poker software. Breakout Poker is quite generous when it comes to welcoming new players to the astounding gaming world of this poker site. So, it offers a match deposit bonus of 200% up to $1000 with its First deposit bonus for all the new players after they sign up. This terrific bonus is not just valid on your first deposit but can be availed on the first three real money deposits at Breakout Poker. The players just need to sign up and make a qualifying deposit while redeeming the promo code WB100 to claim this promotional offer. The Breakout Poker Refer a Friend bonus gives you a chance to enjoy playing with your friends at this poker site and get rewarded for it. All you have to do is enter the names, emails and usernames of your friends you want to refer by going to the 'Refer a friend program' at the bottom right-hand side below the 'About us' section. If your friends sign up by using the referral link, the $10 bonus will be added to your account for every Friend who signs up. Your friend also gets $8 no deposit bonus as they set out the gaming journey at this poker site. Breakout Poker makes sure every player gets his/her chances to win. So, it keeps bestowing them with generous bonuses which can be claimed on daily, weekly and monthly basis. These bonuses include the promotional offers like Omaha chase, Weekly missions, Big hand Jackpot and a lot more. Don't forget to keep a check on the promotions section every time you login so that you don't miss out on any of these amazing opportunities to win. Along with providing a myriad of astonishing bonuses to players, Breakout poker also takes care of the existing players of this Poker site. So, if you are an existing player, you get to win exciting prizes and Freerolls every week with its VIP reward program. With this Program, the VIP/loyalty points are added to your account every time you play online for real money. These points help you win exclusive bonuses, promotions, cashback offers and also help you climb up the VIP levels. Fish Buffet is the unique rewards program of Breakout Poker that gives you chance to win humongous cashback bonuses. Just like the loyalty points, Fish points will be added to your account every time you play at this poker site. These Fish Points keep on accumulating in your account and get you cash prizes. However, the prizes you win with this promotional offer will be credited depending on your VIP level, the higher your VIP status, higher the benefits that you can avail with this rewards program. If you want to enjoy playing your favorite online poker games at Breakout Poker you must sign up for an account. 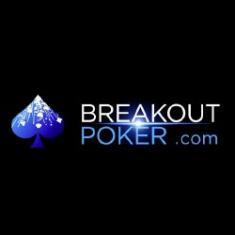 Signing up at Breakout Poker is very easy and takes just a few minutes. Follow the steps given below to sign up for an account. Breakout Poker can be accessed on a wide range of devices so the first step you have to take is choosing the device on which you want to sign up. You can choose any Android or iOS device including your Mac, desktop or your mobile phones. Once you have the device on which you want to play, register for an account by providing your basic details like your name, email and phone number. If you want to use the Breakout poker app, click on the download option on the top right-hand side to start the download and then complete the registration process once you have installed the application. After signing up for an account, heed to the cashier and make a deposit by using your preferred mode of payment mode of payment from the long list of options available at this poker site. But hey! Don't forget to claim your first deposit bonus to kick-start your gaming experience at Breakout poker. Once you have made your first deposit, you won't have to wait to start enjoying your favorite poker games at this site. Just visit the gaming section and pick up the game you want to playing right away. Came across this poker site while searching for the best poker sites and it truly is one of the best poker sites to play at. The site is new so it takes some time to get familiar but their customer support (available through e-mail) is so fast and helpful that it seemed almost flawless although I had to contact them multiple times. Breakout Poker also accepts crypto currencies which is a huge plus point for players like me who prefer it over real money play. But I like the way they have taken care that no one faces inconvenience and other methods like Neteller and skrill are avilables as well. Would definitely recommend it to anyone who looks for a flawless gaming. Although the customer support is really nice and I would rate it 10/10 but I really wish it had a live chat option. Please enter your review for the Breakout Poker.